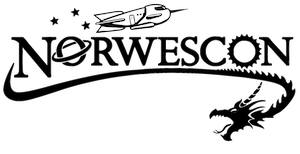 The origins of Norwescon are easy to find thanks to the NW Convention History wiki set up by Don Glover, but I thought it would be fun to do a series of posts looking into where the people who started Norwescon and our former guests are now. Norwescon was originally organized by around 16 people. For comparison, NWC 32 had a convention committee over 100 people. For the first two years, it was chaired by Gregory Bennett, who founded the Artemis Project in 1994, a private project working to set up a colony on the moon by 2002. For the first four years, Norwescon had three Guests of Honor. The Guest of Honor for Norwescon 1 was Theodore Sturgeon, who died in 1985 in Eugene, Oregon. He is best known for the novel More Than Human; Sturgeon’s Law, “Nothing is always absolutely so,” and Sturgeon’s Revelation (included in the previous link), “Ninety percent of everything is crud.” His last published work was Godbody, which was published after his death. The Fan Guest of Honor was John D. Berry, who is currently working as an editor and typographer in Seattle. He designed the program for the Seattle World Fantasy Con and is currently the president of AtypI. The Toastmaster was Alan E. Nourse, who died in 1992. He was a physician and author, whose science fiction writing helped him pay for medical school. He practiced medicine in North Bend, Washington. His sci-fi works were mainly about medicine and psionics, and included a novel called The Bladerunner, which inspired the title of the movie but not, of course, the plot. His book Star Surgeon and a number of his short stories are available in free audio book format on Librivox*. * Librivox is a free audio book program that is no way affiliated with Norwescon. Available stories are all in the public domain. Stories are usually read by multiple volunteer readers, with varying audio qualities. Enjoy! “Looking Back at Norwescon 1,” Norwescon History, accessed April 19, 2019, http://history.norwescon.org/items/show/3.